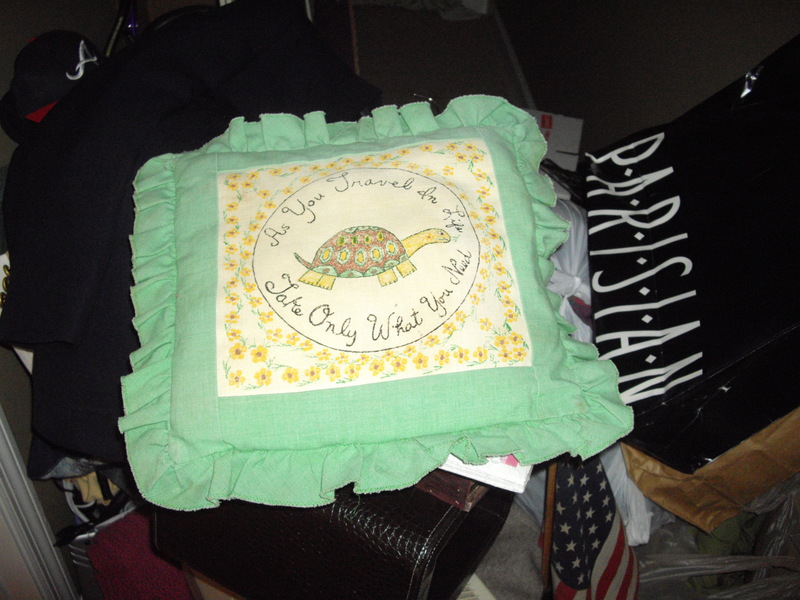 I’ve had the above pillow that my Nana made for as long as I can remember. As evidenced from the pic, it’s sitting atop a pile of Stuff (with a capital S to note how much stuff there is in the pile). The good news is that all that stuff (besides the pillow, of course) is going to Goodwill. I’ve suddenly become very generous since deciding the time was right to move 2,000 miles across the country. The irony of the simple message on the pillow is that I’ve never had to follow the advice on it; I’m a chronic overpacker when I travel, and very much a packrat in general. But moving so far away, I’ve had to give in and give lots of things away. And for the Priceless (capital P!) things I can’t bear to part with, there’s the requisite storage unit. In the current issue of Town & Country, the legendary Ali MacGraw looks back on her storied life and offers up many quotables on what it’s been like to be her. Besides the numerous quotes on sobering up and being single, she offered this one up: “Once you’ve had a [house]fire, you don’t really stay attached to a chair or a vase, and there’s a huge freedom in that.” I read this quote about a week ago, as I was furiously beginning my packing and purging. At first I was a bit offended; MacGraw seemed to almost have a superior air as a fire survivor. Then I realized she was merely telling the truth: Once you’ve lost everything, there’s nothing left to lose. Not to mention that your emotions and emotional attachments aren’t so caught up in material things. I think that’s a very hard concept to grasp, unless you’ve indeed lost everything. Most every item I still own after so many moves in the last nine years–whether it be a shirt, a piece of art, or a blanket–has a memory attached to it. But when do those memories outlive the actual object, to the point it’s okay to part with that shirt, blanket, or framed print? That’s a hard question to answer for a packrat like me! But Miss MacGraw hit the nail on the head about the huge freedom that comes with losing the attachment to material things. A couple of things of mine were headed straight for the storage unit until I realized they were weighing me down. Rollerblades, I’m looking at you! Considering the last time I rollerbladed was when I lived in my first apartment at age 19, it’s time to give those suckers to Goodwill. With my luck, rollerblading will make a massive comeback this summer, but I’ll take that chance. I’ll end here, as I started this blog this morning when I got home from work, then fell asleep writing it, and now I’ve finished the above paragraph and realize that Packing is calling hollering my name! I say Packing (yes, another capital), but it’s more a combination of sorting/keeping/purging/regifting/Goodwill-ing, with a tiny bit of taping/labelling/stacking of boxes going on. Nana’s pillow says it best: “As You Travel in Life, Take Only What You Need.” And yes, the pillow is making the cross-country journey with me. Stay warm, everyone! My next blog will be from lovely Las Vegas. Bri, I had no idea you had a blog. Adding you to my Google Reader this instant. Feel free to drop by mine as well. It’s not private by any means but I also don’t post about it on Facebook because I don’t want everyone knowing I have one. So we’ll just keep it between us. I have also recently learned how to give things away. I guess moving in with another person that is even worse than me about keeping every little thing showed me how silly it is sometimes to get so attached. I have purged a ton since we moved into our new house and have pleaded with Jason to do the same. He is slowly coming around. Good luck in your move! Can’t wait to hear all about Vegas!